Pirates & Privateers : Hello! The hold where the powder was stored had a special name, a feminine name (I think). Do you know it? Question of Philippe 45 (09.17.2015): Hello! The hold where the powder was stored had a special name, a feminine name (I think). Do you know it? 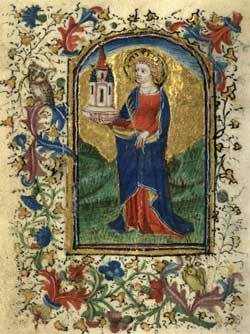 A: This is Saint Barbara. The Spanish word santabárbara, the corresponding Italian word Santa Barbara, and the obsolete French Sainte-Barbe signify the powder magazine of a ship or fortress. It is this that is invoked to ward off thunder, lightning, and all accidents related to the explosion of gunpowder, hence the name of the local powder and blasters in ships. Barbara or Saint Barbara have lived in the middle of the third century (235 and 303BC. AD) in Nicomedia in Asia Minor (now Izmit, Turkey - a port on the Sea of ​​Marmara). According to legend St. Barbara was the daughter of Dioscorus, a pagan rich, who wanted to protect her virginity (or protect the Christian proselytism). He locked her in a high tower with two windows. But a priest disguised as a doctor was introduced in the tower and named. Upon returning from a trip Barbara told her father that she had pierced a third window in the tower wall to represent the Holy Trinity and she was a Christian. Madly renaged her father set fire to the tower. Barbara managed to escape,but a shepherd discovered her and informed Dioscorus. The latter was dragged before the Roman governor of the province who threw him in jail and she was whipped and tortured. As Barbara refused to renounce her faith, the governor ordered the father to decide the fate of his daughter. That's when she would have had, it is said, a vision of Christ. While her father was about to put her to death, she prayed that all who invoke come true. Dioscorus the decapitated was immediately punished by Heaven: he died struck by lightning. Given the circumstances of his death the tradition of Saint Barbara was the patron of architects, firefighters, miners, artillerymen, metallurgists, and other corporations related to fire. It is this that is invoked to ward off thunder and lightning, as well as all accidents related to the explosion of gunpowder. Saint Barbara is usually represented with one or more of the following attributes: a tower with three windows, a flash, a book, a crown of martyrdom.